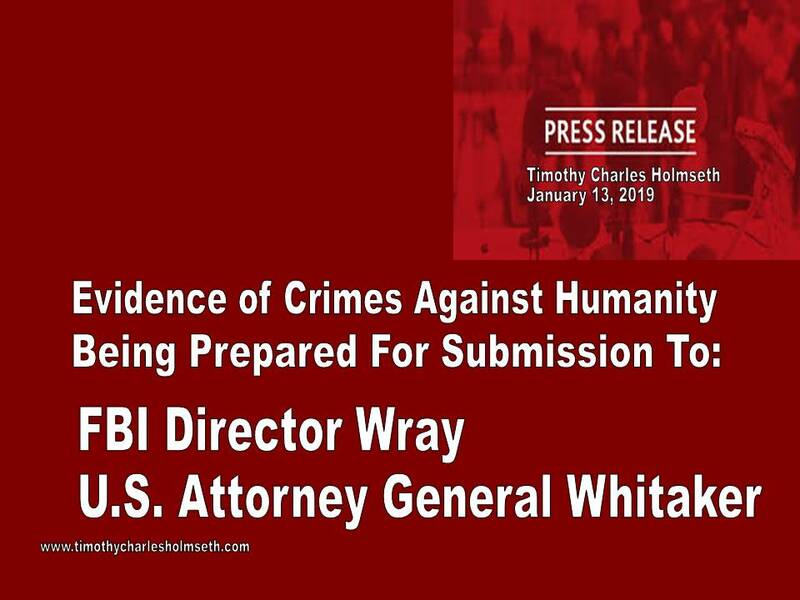 Timothy Charles Holmseth is preparing a presentation of evidence and documents to be delivered to the FBI Director and Office of the Attorney General of the United States. The complaint will provide FBI Director Christopher A. Wray and U.S. Attorney Matthew G. Whitaker’s office’s evidence that shows there is an organized secret society deeply embedded into state and federal government, as well as law enforcement in Minnesota and Wisconsin and elsewhere, that is committing crimes against children and humanity at unspeakable levels. The presentation will include evidence regarding, but not limited to, the kidnapping and ritual sacrifice murder of Jacob Irwin Wetterling. Timothy Charles Holmseth is an award winning news reporter and investigative journalist. He is an FBI witness in a national profile kidnapping case. He captured rogue CIA and FBI child traffickers on tape discussing their operations. He has been targeted for a decade. Next National Center for Missing and Exploited Children a front for international child trafficking – hiding Jacob Wetterling evidence? They got this site as a virus. I had to say go there anyway to get here. Then they did it again, while i was scrolling this page. Just letting u know. I know u through all your videos. Im glad to see you again Timothy. Copyright © HOLMSETH All rights reserved. | CoverNews by AF themes.